Ashampoo ClipFinder HD is the ultimate clip browser with a breathtaking video wall and MP3 conversion from videos! Find, view, save and convert web videos in HD or SD! Search in up to fifteen video portals at once or in selected portals, view videos directly and convert and save them to your hard disk with a single click. Nothing makes finding, viewing, saving and managing web videos easier. 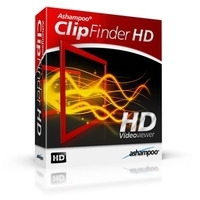 Ashampoo ClipFinder HD currently supports the most 15 popular video portals like YouTube, Vimeo, Spike, Veoh, Google Video, LiveVideo, Dailymotion, blip.tv, Yahoo! Video, Metacafe, MySpace, SevenLoad, MyVideo, videu and ClipFish. Enjoy videos on the revolutionary 3D Video Wall, download and convert videos with only one click, play your favorite videos with the new cool video player in full-screen mode, just add new clips into your playlist by the fly (Enqueue to Playlist function), start new searches for more videos in single tabs - like tabbed browsing.